This is a sequel to "Alternate Armageddon". please do so before beginning this adventure! 1) This is an alternate fiction which takes place during the HTLJ episode, "Armageddon Now". Iolaus was forced to enter a world where Hercules never existed. Bad things happened, including the rise of "Xena, the Conqueror" who was never touched and/or motivated by the son of Zeus to turn from her evil ways. 2) In "Armageddon Now" Gabrielle was brought before Xena who told her men to put her on the cross and break her legs. I've said it before: Iolaus is watching this and he WOULD NOT have let it happened. No way! No how! It doesn't matter whether Iolaus thought he could change what was going to happen or not -- he would NOT have been able to sit still and watch Gabrielle get her legs broken. It goes against his character. So, in my fiction, "Alternate Armageddon", I changed that scene. Iolaus DOES rescue Gabrielle and helps her get to safety. Gabrielle is at first frightened and untrusting of Iolaus but eventually softens and tries to get him to join her in a rebellion against The Conqueror and her minions. Iolaus, of course, can't do it. He has to find Ares and try to get the war god to help him undo the terrible thing that has happened (yeah, right). 3) This fiction takes place an hour after the moment when Gabrielle and Iolaus say goodbye .... Enjoy. PRESS ABOVE PHOTO FOR LINK. This fan fiction is rated R to NC17 for graphic descriptions of violence, adult situations and semi-graphic references to sexuality. 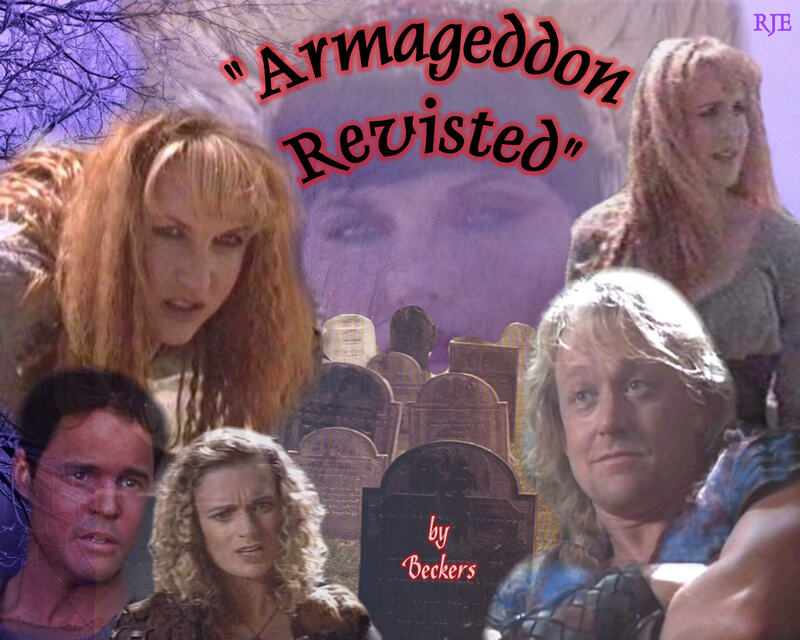 "Armageddon Revisted" is fan fiction. No part of this on-line story is meant to infringe on any holders of "Hercules: The Legendary Journeys" or "Xena, Warrior Princess". No profit is being made by the distribution of this fan fiction. No part of this page or any other connected to "Armageddon Revisted" may be reproduced without the consent of author/artist. Thank you.